Just as I thought my lucky streak was wearing off, I got a phone call last week notifying me that I had been chosen to attend the premier of "Annyeong" ("Hello"), an interactive movie promoting Korean tourism featuring the members of 2PM and miss A. It came as a bit of a surprise to me, as I had totally forgotten I had applied through Buzz Korea, a blogging network/ tourism website. When I got the OK from my boss to take the morning off of work, I became ecstatic not only that I would be meeting K-pop idols, but would also be participating in an event to promote the country that has become my second home. I headed out to Lotte Cinema Avenuel early Tuesday morning to sign in. Upon my arrival, there was already a small group of eager fans waiting to get into the theater. After registering, I was given a gift bag which included the latest albums of 2PM and miss A as well as a promotional poster for the movie. As I rummaged through my goodies, I met some other bloggers and expats. Soon, staff announced it was time to enter the theater and we did so excitedly. Though the theater was small, tons of press had already set up camera equipment and microphones, competing for the best spot to shoot the event. KTO's CEO, Lee Charm, approached the stage to introduce the organization's goals of increasing tourism over the next year and explained how they hoped "Annyeong" would help them accomplish their objectives. I was pretty impressed with Mr. Charm's language skills as he switched from Chinese to Korean to German to English effortlessly. Oh, how I could only wish to be so global. Soon enough, the theater was filled with the flashes of cameras as the members of 2PM and missA entered the room and took their seats on stage. 2PM looked flawless in their black suits and missA was as sassy as ever in their flirty mini dresses. There was an interview in which they discussed each member's role in the video and the idols each made comments about their personal experiences in making the movie. This was all translated into English to accommodate us foreign guests. We were later showed the premier of "Annyeong" and I have to admit, I was quite impressed. The "movie", which will soon be released on the Buzz Korea website, is essentially a virtual 3-day trip around Korea (mostly Seoul) and is interactive in that the viewer can change the course of the movie. Various sites included in the movie are the Seoul Tower, Samcheongdong, and of course my favorite place, the Bukchon Hanok Village. In one segment, viewers can "go shopping" by selecting specific clothes at a stylish boutique in Apgujeong. In another, he or she can chose either a member of missA or 2PM to be his or her guide around a palace in Seoul. I've never seen anything like this video used as a tool for tourism and I'm really looking forward to it's release on the internet. 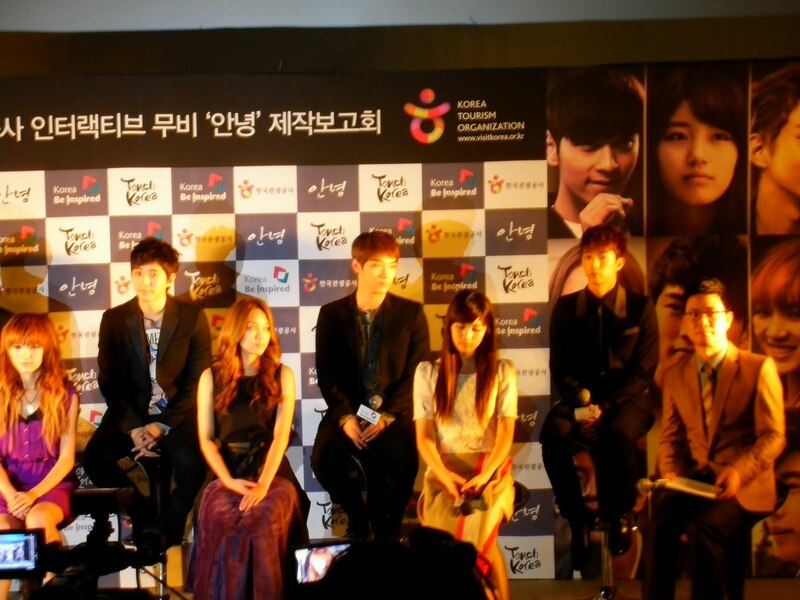 Members of K-pop groups 2PM and missA are interviewed about their experiences making "Annyeong". After seeing the movie and the movie outtakes, 2PM and missA were named honorary ambassadors of the Korean Tourism Organization. 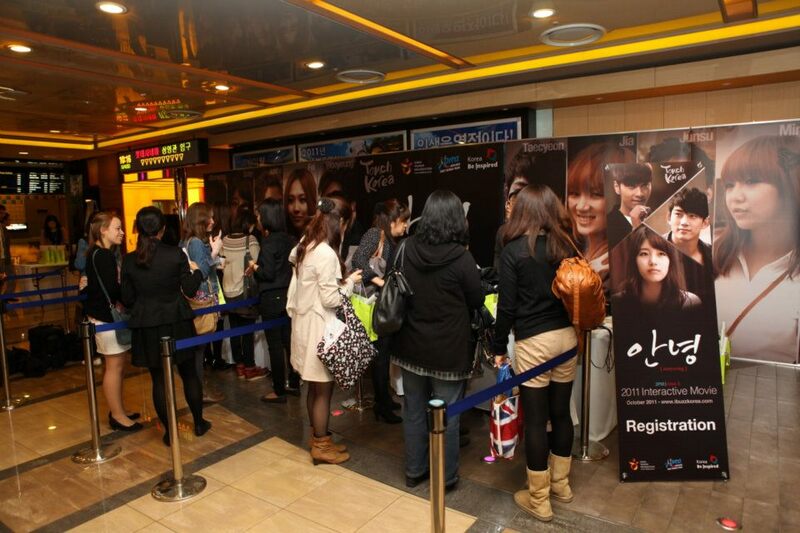 There was also a special raffle held in which 3 members' clothes from the movie were given away to lucky participants. Unfortunately, I wasn't one of them but I would have loved to have won Suzy's pretty dress, though I doubt it would have fit. 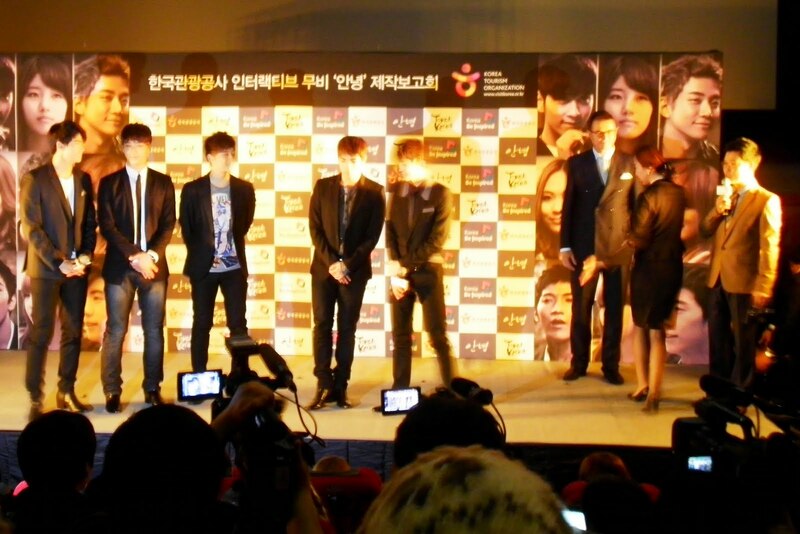 Here, the guys of 2PM are named honorary ambassadors to Korea by the Korean Tourism Organization. We then headed back to the theater lobby for the fan signing. I had met a fellow English teacher and we hurried to be first in line. Sure enough, we were and we waited anxiously for our first close-up glimpses of the K-pop idols. Unfortunately, we were not allowed to take pictures with them but I had them each sign my movie poster. I also got in a few nervous words to my favorites and had a small ego boost when Suzy commented that she liked my dress. Though I had rubbed elbows with 2PM when I danced in the Dream Concert back in May, my heart just about melted when each of the guys from 2PM smiled at me and I held back a crazed "I love you" when Junho signed a big heart under his name. The teacher I had met got even move laughs, as he asked the members to sign his arm, something unheard of on this side of the globe. Our meeting time was up too quickly and I had to get going to make it to school in time for my afternoon shift, but I was a happy girl after having such a cool opportunity. miss A and 2PM enter the lobby for the fan signing. Can you guess who was first to meet them? Yeah... be jealous. 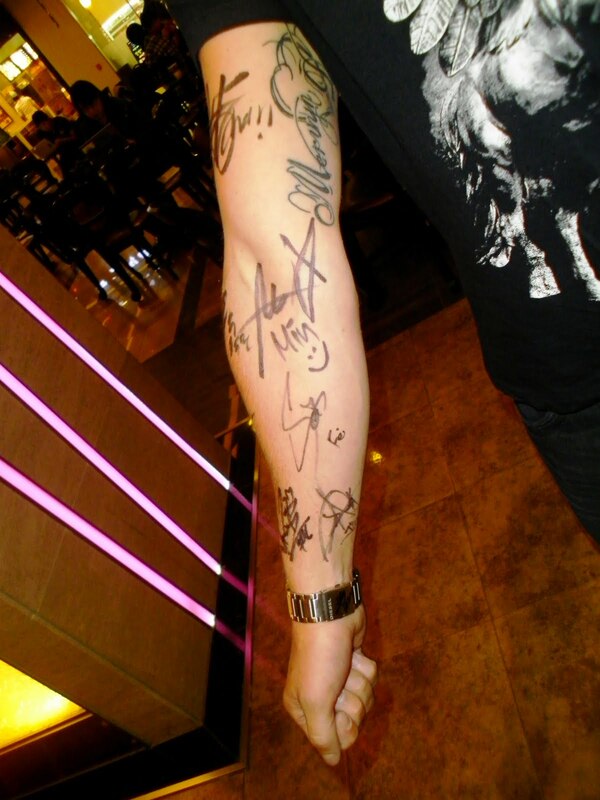 A guy I met had them sign his arm. I couldn't tell if they were amused or weirded out. 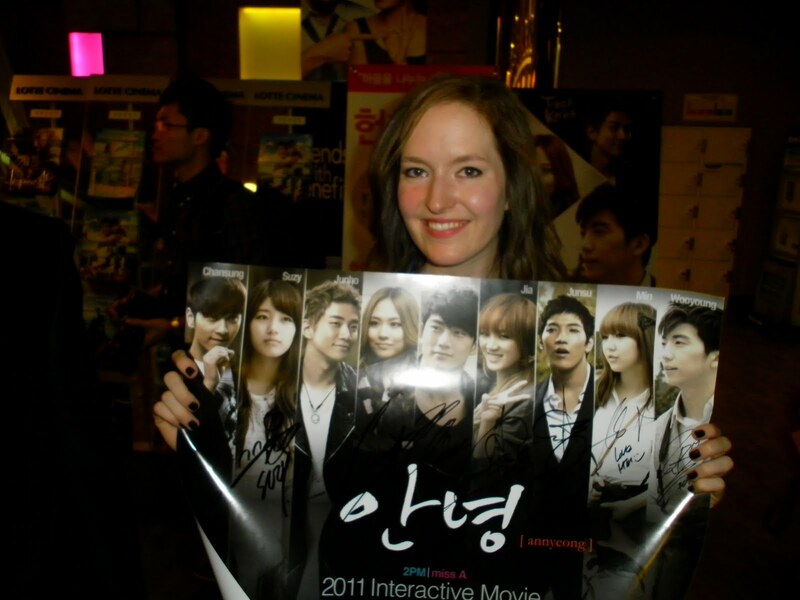 Me, posing with my signed "Annyeong" poster. There's no doubt that Korea is Asia's best kept secret. Even though the small country sees its fair share of Asian tourists, the numbers of Western tourists are still relatively low. Sure, Korea doesn't have the Great Wall or sumo wrestlers or what Westerners might regard as famous landmarks; however, it does have a lot of heart and even more soul. It seems to me that "Annyeong" does a pretty good job at showing off some of the country's flair in a unique way that would inspire its viewers to hop a plane and explore the nation and its culture in person. If the tantalizing food and beautiful mountain side scenery in the movie don't do it, Taecyeon's smile will. Hi!! Just came across your blog today!! Looks like you're having some fun adventures!! :D Do you speak Korean well? I'm sure you've learnt a lot from being there :) Just wondering, do you watch Korean dramas? Hi!! Sorry for the late reply. I don't speak Korean well but I try to study a little bit everyday. I LOVVVEE watching Korean dramas. I like "Secret Garden" and "You're Beautiful" but my all time favorite is "Boys Before Flowers". Watching them is a great way to study the Korean language and culture. Thanks for reading!